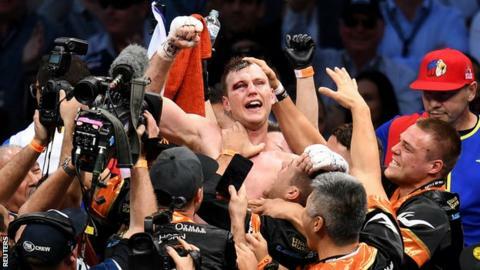 Former schoolteacher Jeff Horn stunned champion Manny Pacquiao to win the WBO world welterweight title with a unanimous points decision in Brisbane. The three judges scored the fight 117-111, 115-113, 115-113 to the 29-year-old Australian at Lang Park. "That's the decision of the judges. I respect that," said 38-year-old Pacquiao. The Filipino, an eight-weight world champion, has now lost four of his past nine fights. Horn, 29, was aggressive from the opening bell, although Pacquiao's left jabs scored points in the early stages. Horn, who has now won 17 and drawn one of his 18 bouts, caused Pacquiao problems during the middle rounds and cut him above both eyes. The veteran fought back with a brilliant counter-attack in the ninth round, only for Horn to win the 10th. Both fighters tired in the final two rounds, with Horn's good work in the opening stages proving enough for a famous win.